From the Collection of the Schilling Library Archives, Desert Botanical Garden, Phoenix, AZ. by Jeff Smith/Fotosmith, Tucson, AZ. Tucked in among Mary Emily Eaton’s watercolors in N.L. Britton and J.N. Rose’s The Cactaceae (Vol. I, 1919) are the small yet remarkable paintings of Louis Charles Christopher Krieger. Fifty years passed before Krieger’s cacti works appeared again, this time with more prominent placement and recognition, in Lyman Benson’s The Native Cacti of California (1969). 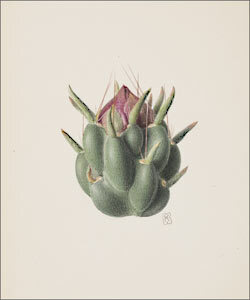 The subject of these unique paintings is the family Opuntia – the stems, joints, fruit, buds, and petals. 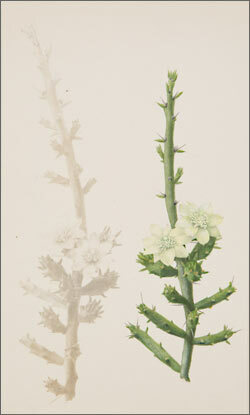 While Krieger’s botanical subjects were not particularly unusual, his painting method was quite distinctive. 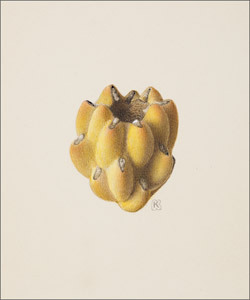 In 1912 Krieger worked at the U.S. Department of Agriculture in Chico, California, at the Plant Introduction Garden whose director, David Griffiths, was studying the forage potential of prickly pear cacti. Griffiths had traveled extensively by motorcycle throughout the Southwest and Mexico where he collected and photographed some 6,000 Opuntia specimens. Without the benefit of color photography, Griffiths needed artists to prepare descriptive illustrations of his cacti, but as this work was primarily a government project, he also needed to avoid the time-consuming and costly process involved with preparing botanical paintings. The solution was a process involving his vast collection of glass plate negatives whereby he would make very light photographic prints that Krieger would then paint with watercolor. This efficient method produced results that greatly enhance both the realism of the original photograph and the depth and form of the watercolor painting. While Krieger is widely recognized for his excellent mycological paintings, these unusual and striking cacti paintings deserve wider exposure. The Florilegium Program’s current exhibit, Botanical Art of the Sonoran Desert: Past and Present , includes five of L.C.C. Krieger’s paintings that were generously loaned to the exhibit by the Desert Botanical Garden's Schilling Library Archives. The exhibit is being shown in the Ironwood Gallery and the Baldwin Education Building at the Arizona-Sonora Desert Museum through October 27, 2013. This appeared in the October 2013 issue of The Desert Breeze, the monthly newsletter of the Tucson Cactus and Succulent Society.